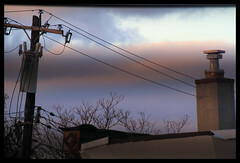 Snapped this series of shots last evening around sunset. This is how a sunset looked last evening. I haven't Photoshopped any colors in or anything. I'm still getting adjusted to losing that hour of sleep, so I was too tired to even retouch this image last evening. I love the fact that we still have light at 7:00pm even though I'm still trying to regain my hour. It gets harder the older you get.